The tour group gets a traditional bull cart ride with ‘Papito’ the bull and farmer Patrick. 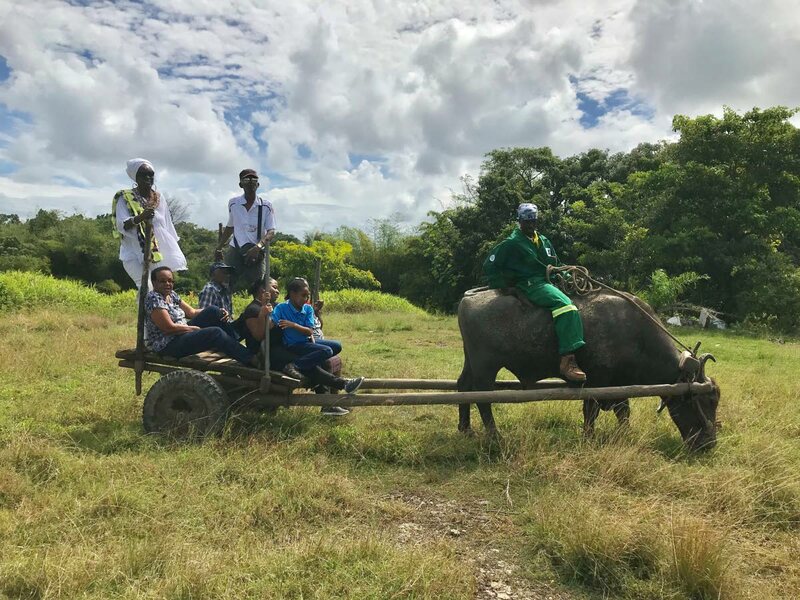 As a child, growing up with family who worked in the rural areas of Trinidad, you heard about things such as the bull cart as a means of transport for agricultural produce as well as people to and from rural areas. In recent times, bull cart riding has become a novelty and is rarely seen in rural areas. A recent trip to Princes Town, courtesy the “Discover our Merikin Heritage” tour, was a journey that brought back childhood memories of stories I once heard from my grandfather about bull cart riding. Farmer Patrick and his bison “Papito” took us through a small field to experience the traditional ride that was commonplace in the 1800s. About eight passengers loaded-up the very shaky cart and headed downhill with a hungry bison which stopped to eat grass along the way. The historical journey was arranged by the Ministry of Tourism in collaboration with the Merikin Heritage Foundation and explored the Merikin society and lifestyle. Devil’s Woodyard in First Company, outside of Princes Town. “We want to sensitise the nation (to) who we are and share our story,” said Akilah Jaramogi, a member of the foundation on the November 29 tour. The Merikins, a name derived from the word “American,” are a group of people whose ancestors were brought to Trinidad in 1816. The Merikin soldiers, who originated in places in West Africa such as Sierra Leone, Senegal and Ivory Coast, had been taken to the United States to work on plantations. Many escaped and joined the British to fight for them in the war against the former American colonies, with the promise that each of the 276 soldiers would receive 16 acres of land. They originally settled in Bermuda and then were taken to Halifax in Canada before finally settling in Trinidad, then a British colony. On arriving in six different batches, known as companies, they were placed in different areas of Princes Town. The tour began in First Company, at the mud volcano known as the Devil’s Woodyard. Jaramogi said the volcano got its name from the Merikins after an earthquake. They believed that the cause of the tremors was the devil passing through the forest that knocked down all of the trees and thus the name was born. The very small mud volcano is only slightly active with small bubbles of mud still seen rising from the ground. 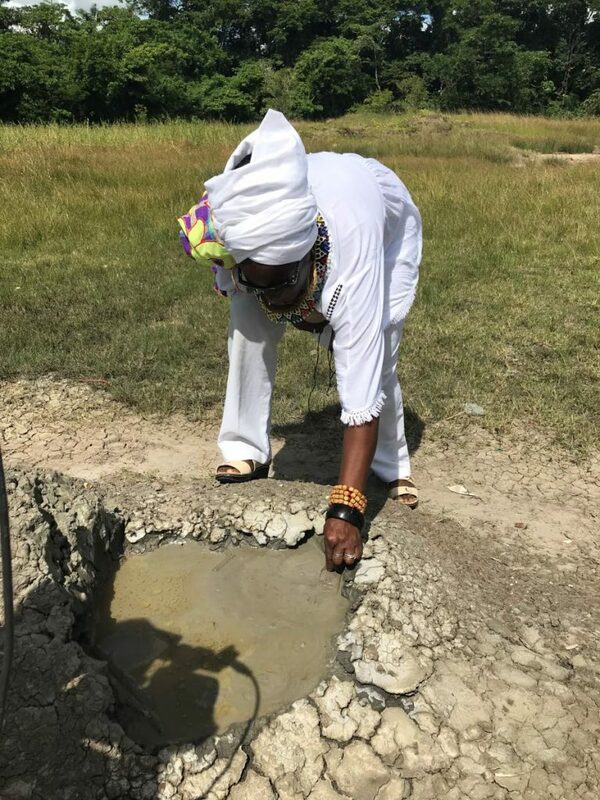 Jaramogi said the mud was used to bathe, and many people still use it on their skin as they believe it creates beautiful, glowing skin. According to Jaramogi, popular areas in Princes Town inlcuding the Matilda Junction are named after some important Merikin people. Ma Matilda was a woman who helped people during their travel by providing a rest stop and sanctuary. During the small driving tour, Jaramogi educated the group on a very important man of the Merikin society, Papa Neezer, who was an ancestor of hers. 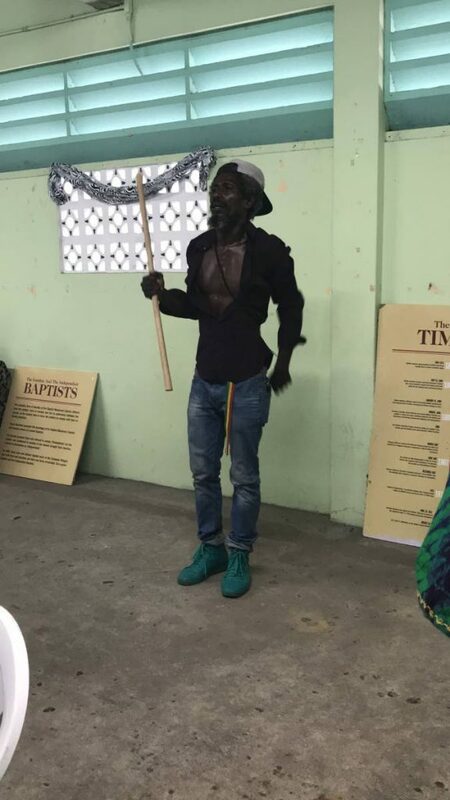 Neezer’s name features in one of Sparrow’s popular calypsoes, Obeah Wedding. Stickfighter ‘King James’ singing one of his chants, preparing for a stick fight. Samuel Ebenezer Elliot aka Papa Neezer grew up as a member of the London Baptists faith, until he became intrigued by the Orisha faith and eventually became an accomplished leader of the religion, Jaramogi said. He revealed to his community that he was given special healing powers to cure the sick and cast out evil spirits. He was given the name “Papa” over the years for his kind and giving actions, Jaramogi said. Papa Neezer was a direct descendant of two of the original Merikin settlers, George Elliott and George Blackwell. Following a short, driving tour and exciting bull cart ride, we were taken to a small lodge where a traditional, home-grown lunch included coo coo, callaloo, salad, pigeon peas and fried fish, along with a thrilling display of stickfighting. Reply to "A Merikin Journey"